Click here for another Mom’s Closet story. 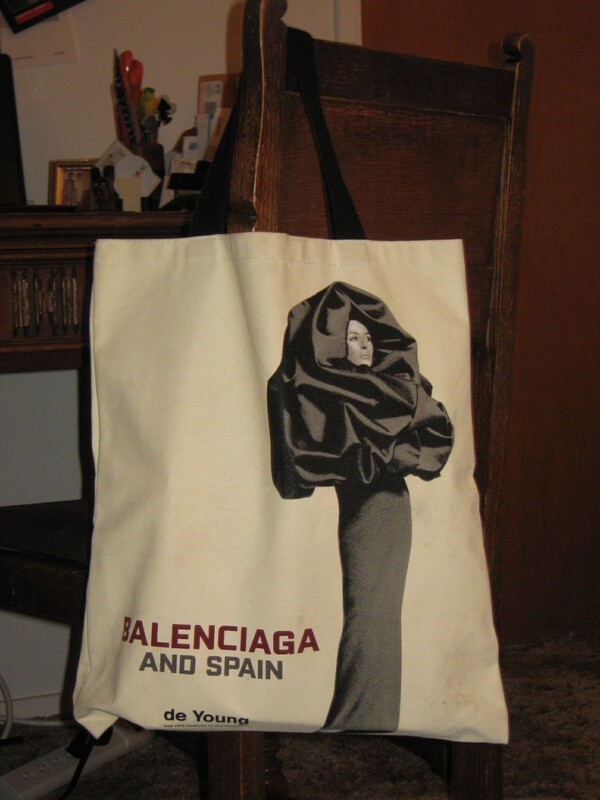 This unusual tote was calling to me at the San Francisco de Young Museum’s Balenciaga and Spain exhibit. Made in the USA from coated canvas, it’s strong, easy to spot clean, and oh-so-chic. 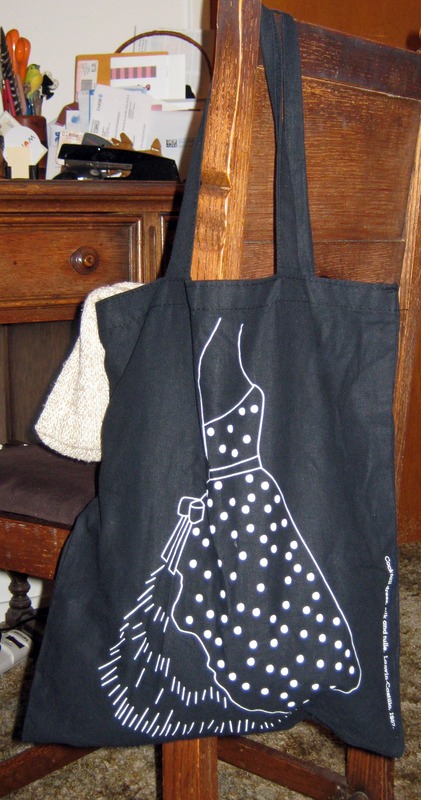 I grab this tote when I’m headed out walking to the postoffice and/or my local drugstore. It holds a wallet and other essentials with enough room for mail and small items I might buy, eliminating the need for plastic shopping bags. An added bonus is the handles are just long enough to fit comfortably over my shoulder. Check back next week for another installment of A Tote Bag a Week. Custom made coat in progress. Faux braodtail fur will be added to the collar. The July issue of Harper’s Bazaar magazine covers what’s up for fall, including Statement Coats. Houses such as Alexander Wang, Dior, and Nina Ricci are showing big silhouettes in bold colors for fall/winter outerwear. 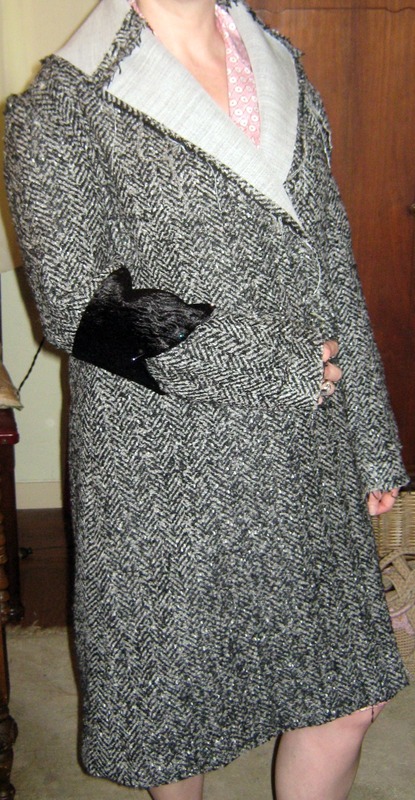 1920s Day Coat from the book, The 1920s by John Peacock. Well, I got my own Statement Coat in the works and it’s sayin’ 1920s. Designer Theresa LaQuey has been building a coat for me based on a 1920s version I found in John Peacock’s fashion book The 1920s. The fabric is a lovely Italian tweed from Stonemountain and Daughter. The collar will be covered with faux broadtail fur which comes from a vintage stole my mother gave to me. In fact, this custom-made coat was all her idea. If you’re a regular reader of Over Dressed for Life, you know I believe we get the most for our money with custom-made. For as much or less than we would pay for designer ready-to-wear, we get better quality and a better fit which means the best look. Plus, supporting local designers is a very good thing. There’s no instant gratification, but I learned a lot from watching the piece develop. It’s been great fun choosing the fabric and consulting with Theresa on what kind of pockets I want, where the hem should hit, and pondering plain lining or wild. Having such control is great and of course I love the fact that this coat is one-of-a-kind. Check back soon for a peek at the finished product. Tote from the V&A in London. I don’t recall my mother ever carrying a tote bag, except perhaps to the beach. I, on the other hand, carry one just about every day. In fact, on the rare occasion I’m not toting a tote, I feel something is missing. Hectic lifestyles call for carting around a lot of stuff. I have my daily tote, which contains: lunch, I.Pod, notebook, book, mags, scarf, and a change of shoes. But I also have an array of totes for specific needs. I thought it would be fun to share with readers some of my more interesting totes, where I got them, and how I use them. Pictured left is a cotton cloth bag I picked up at the Victoria & Albert Museum. It was the first of what has become a collection of totes from museums. This one was from the exhibit – The Golden Age of Couture: Paris & London, 1947-1957. Tune in next week for another Tote of the Week. Stylist Tyese Cooper. Photo courtesy of Tyese Cooper. Tyese Cooper and I have crossed paths several times at local fashion shows. Stylish and friendly, I always enjoy seeing her. Tyese runs her company Tais Elyse out of Oakland and stays busy working as a fashion designer, stylist, and personal shopper. Speaking of shopping, now through August 7th Tyese is hitting the shops and markets in Paris and London buying up unique goodies for us back home. While she’s still on the road, she’ll post her finds and we can purchase in (almost) real-time. Tyese is doing all the work so we get to kick back and lounge in the fog. That's me and Skylier Blanchard in her West Oakland studio. It was such a pleasure to spend a recent Saturday afternoon with Skylier Blanchard in her new fashion production studio. 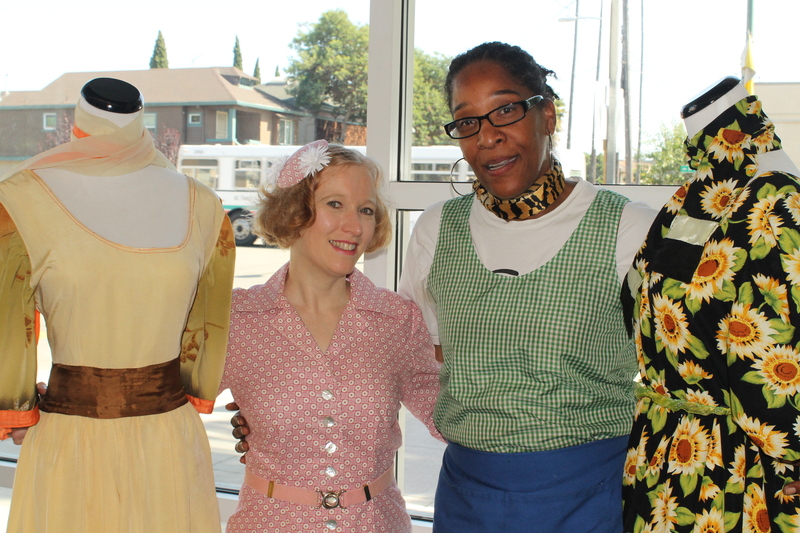 Skylier has opened Skylier Wear in West Oakland. Skylier can do it all and she’s doing it. 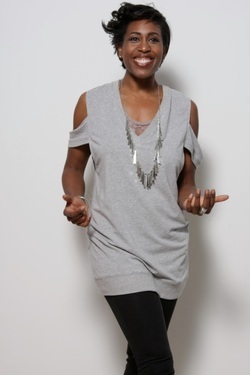 She has been working toward running her own clothing production business for the last twenty years. With an incredible drive and work experience from companies like Lilli Ann and Esprit, Skylier is now well on her way to fashion production stardom. 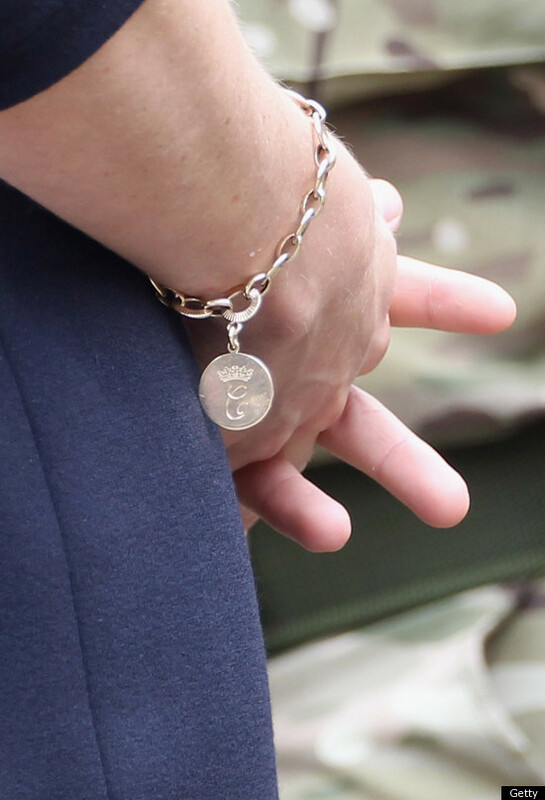 Last week while on an official visit to Canada, Catherine was spotted wearing a single charm on a bold link bracelet. Turns out that was a wedding gift from her step-mother-in-law, Camilla. It’s reported that the disk charm has a C on one side for Catherine and a C on the other for Camilla. It seems Camilla has a thing for giving Cs as presents. As I recall, she gave Prince Charles interlocking C cufflinks before his wedding to Lady Diana Spencer, who was none too pleased with the letter C.
Like Catherine and Camilla, I too like my own initial. For my 17th birthday, my mother got me started on initial jewelry with a simple gold M pendant from Shreve & Co. I still have and wear that M and it’s still my favorite. Mom also introduced me to monograms. She had her monogram embroidered on her Oxford shirts and printed on her stationary. But Mom didn’t stop with her own monogram. When she began collecting antique jewelry, she would wear brooches with monograms other than hers. As long as it was an interesting piece of jewelry, she thought nothing of sporting any combination of letters. 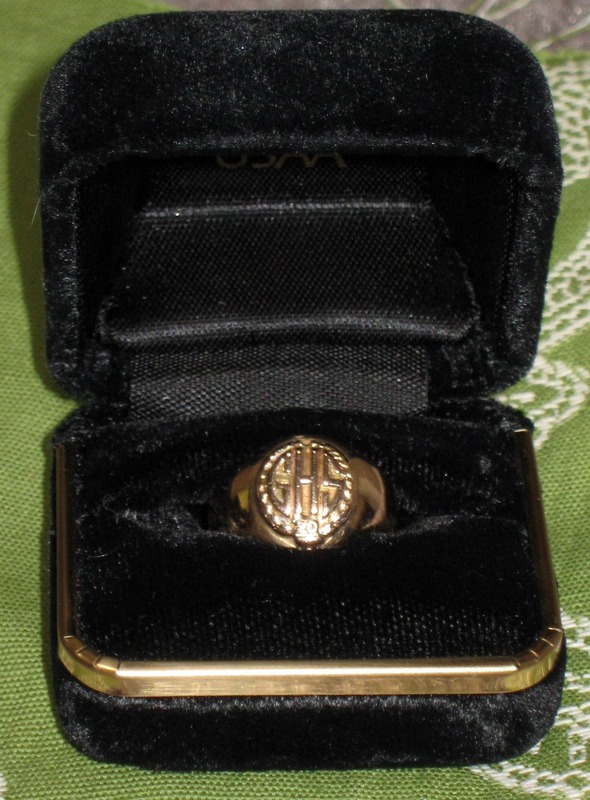 When I was younger, I prefered to stick to my own monogram or that of something I was connected to, like my college class ring. But now I think it’s creative to mix it up. Lately, I’ve been wearing my great-aunt’s high school class ring. It has three letters in raised gold – GHS – which stands for Greensburg High School. At the bottom is 1920, the year she graduated. I’ve never even been to Greensburg, but I love this sweet ring for the family connection and the Art Deco style. What do you think? Are monograms your thing? Would you wear one other than your own? Leave a comment and do tell.